Randy’s Saturday Night Challenge for this week is to create a timeline. I love playing with timelines! This is going to be fun. I chose my great great grandmother, Ana Jacinta de Mello, for this challenge. I’m using RootsMagic 5 to create my timeline. What I noticed right off the bat is that this timeline leaves out an important piece of Ana’s life. It leaves off giving birth and children that died young. I don’t think a mother’s timeline can be complete without this data. 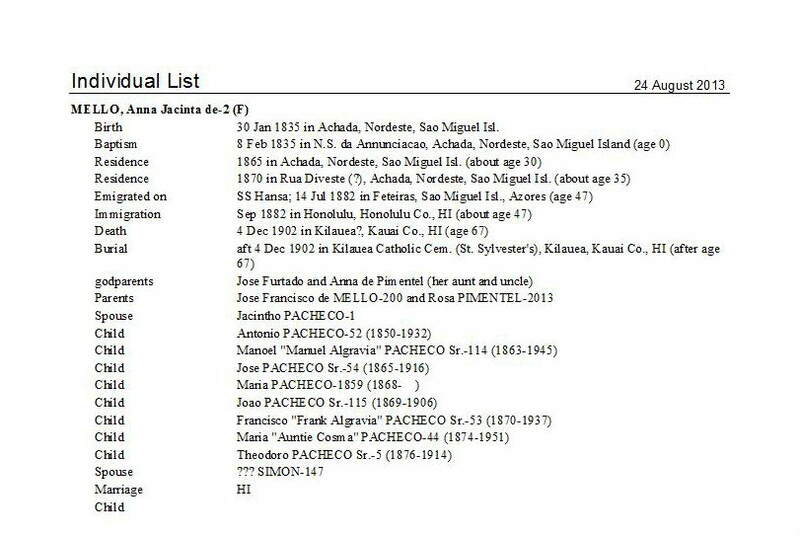 Birth 30 Jan 1835 in Achada, Nordeste, Sao Miguel Isl.